Day 3 started off with us waking up pretty late after last night’s antics with the Persona 3 group I was in. 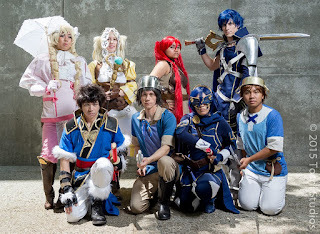 So I would wake up around 10am and dressed up as Donnel again for the Fire Emblem: Awakening gathering. When I was heading over to the gathering location, I would be stopped by a rover as he saw my staff and quickly wanted me to get it peace bonded. He led me to the main hall of the convention center where there was a table for peace bonding. The guys behind the table sees the staff and responded to me saying this cannot be peace-bonded due to the tip of the staff being harmful and could strike someone and hurt them. Now I haven’t gotten a prop denied since AX 2013 and this prop was made by hand with PVC and wood. The wood was plywood and was shaped for the spear head. They wanted me to scratch the tip to make it flat in order for it to be peace bonded. So I walked away from the peace bonding table scratching the tip off the head of the spear as a frustratingly went to the gathering. It was located at the park in front of the Fairmont Hotel. Most of the cosplayers were from the game Fire Emblem Awakening since it was the latest game to come out from the franchise. There were a few Marth and Roy cosplayers that were from the older Fire Emblem games, but then again they can be mistaken as people from the Super Smash Bros. Series. Overall many people attended this gathering and we had our fun and silly times with the shoots we have. What’s best about this gathering is that everyone was so friendly that all of us became good friends and hope to see each other again at other anime conventions cosplaying from Fire Emblem again. I then gathered my Fire Emblem friends (old and new) to follow me where I would ask a photographer to take a photo of us before we parted ways for our next cosplays. My next cosplay of the day would me gender-bent Madoka Kaname that I wore on day 1 of Fanime. This time around, the whole gender-bent group would be able to meet. Unfortunately, the females couldn’t meet up on this day so they decided to wear different cosplays instead. One of them wanted us for her photo shoot so we would take some time off the con grounds for that shoot. We would actually be outside the Adobe building doing the shoot, even the security guard of the building wanted a photo! We would be there for about an hour long hanging out and chilling while the shoot was going on. The shoot would last an hour, which gave me a good amount to head over to the Fairmont where all of the panels were located (like last year’s Fanime) for this one and only panel I would be able to see: Fanimania. Or otherwise known as the Cosplay Wrestling Federation (CWF). Now some of us Fanime attendees love wrestling and besides the well known wrestlers and the moves that can get a person to the hospital, there is the smacktalk that hypes the crowd into a frenzy. The CWF is just that except for wrestlers, we bring in cosplayers who are cosplaying their own characters for bragging rights. Whomever hypes the crowd the best wins and is the reigning champion of CWF. The story coming into Fanime is that the CWF has been reigned down from a single fish that won the belt at this year’s Anime Los Angeles (ALA). The show continues its trip to Fanimecon and has brought in their compeditors to take down the reigning fish. Throughout this two hour long panel, cosplayers entered the stage and gave off their speech to the already hyped panel crowd and shows them that they deserve the CWF title. Some notable cosplay included a pimped out Mario cosplayer rich with gold coins, Little Mac the true fighter of Nintendo, and Joseph Joestar after taking down Dio in one of the previous CWFs. Many competed and 5 were selected to face off the fish. In the end, after much consideration from the crowd, the founders of CWF have selected a NEW reigning champion, Little Mac! 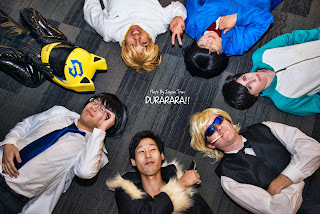 His inspiration has motivated the CWF crowd and has hyped us all at this year’s CWF at Fanime. The show will now continue on to Anime Expo as more competitors from AX will show to try and take down the reigning champion. The panel was very exciting to see as I was there to witness the crowd so hyped up after each competitor’s speeches. Even I have to admit, I was amongst the hype. I mean even if I am not a wrestling fan, you just get amused with the crowd and sooner or later, you get yourself joining in with them cheering for all of the competitors. It was a really awesome experience and I can’t wait to see them again at Anime Expo! Who will be taking down the fish tonight??? After the panel, I would head back to the room to change out of my cosplay and grabbed dinner. Now the rest of the night, I planned to not party hard because you don’t want to regret it when waking up the next morning to leave the con. So I just had a chill night at the gaming room where I met up with all my friends and had a fun time playing Weiss Schwarz, punching a Fist of the North Star arcade game (which was reallly fun), being silly at Purikura, and more. We would be out till 4am doing all these until we decided to hit the hay for tomorrow’s departure. I would give a final goodbye to all my friends whom I may not see again until next fanime and then headed back to the hotel room. Although crazy enough, the sun was already rising when we were heading to bed. Did we really need sleep? Alas, the final day is here which means the end of Fanime. I would only have about a 4 hour sleep since we had to wake up early to pack up all of our stuff that was lying around the room floor and moved our stuff out of the hotel room back to our cars. Once everything was packed up, it was one last dash around Fanime for last minute shopping. And unfortunately in my case, I was so busy with cosplay plans that I didn’t really do much shopping at this con until this day. I didn’t even visit artist alley at all this weekend. This tells you I didn’t really plan out to spend time wisely at this con. So I skimmed through Dealer’s Hall to find out what each dealer has and there were so many dealer’s out there I couldn’t check them all out. I would end up grabbing a Kosaki Onodera Nendoroid from Nisekoi, anime folders, and a Persona 3 Movie 2 Wallscroll from the Kinokuniya booth (I even got my membership since it’s cheaper to buy a year membership at Fanime). After my fun at dealer’s, I would get a call from my friend to help with one of his friend’s video project. 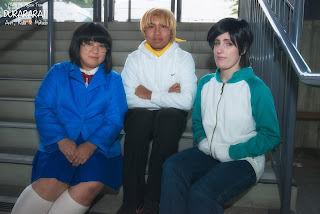 I would help him record a video in our cosplay (I was cosplaying my secret cosplay, Simon from Gurren Lagaan) taking about how everyone should go to Fanime. What was cool about this video project was that he was using a 3D camera. We would get to see a sample of his device and its pretty cool seeing it. I can’t really explain much but I can say that it could help someone experience an event or a show in a whole different aspect. I would then take my last hour of Fanime to the Artist Alley and quickly skimmed through each of the tables. Every table had really good works but with only an hour, I can’t get to fully see all of their artworks. I would end up grabbing a really awesome Super Smash Bros. artwork. I would get a chat with the artist and found out she will also be at Anime Expo. I can’t to see more of her work at that con coming up! And then all the doors are closed for Fanimecon. Dealer’s is locked up, Artist’s alley is cleaning up, and the games are shut down. I didn’t attend to closing ceremonies because I just don’t want it to end. The con was just too soon to end. Fortunately, I would meet with all my friends down at the convention lobby and would take all the selfies I could before they all leave for home. But even if the con is closed, it doesn’t mean we all must leave. The city is still open for the Fanime attendees so I would grab lunch and milkshakes with friends and just socialize with them for as long as I could until we really have to leave. When that time came, I gave my final goodbyes and drove out of the city to home. It was a really notable Fanimecon that I just am glad to live in the bay area to such a great anime convention. I felt like it shouldn’t be over but all good things must come to an end. Until next year then. This year’s Fanime marks the 2nd year that the new building was in effect and so far, it looks like Fanime has gotten everything down with organizing everything in corporation with the new additions to the convention center. Nothing has changed with registration as it is still located at the first floor of the new building and I’m just very impressed with how fast registration has gotten through for everyone. It just takes at most 5 minutes to grab your badge now. The Linecon events from years ago should be faded away from everyone’s mind. It is all over now and everyone should enjoy their convention time more than just waiting over 6 hours for their badge. Artist Alley is still located a floor above the new building and is still running like normal. Nothing really bad to report about this, but then again I didn’t even go to Artist Alley until the last day. Now don’t think Linecon is gone because of registration. Apparently, people want to go to Dealer’s hall a whole lot more than the others. On the first day of con, the Dealer’s hall wasn’t supposed to open up until 1pm and we see a huge line from dealer’s hall to the room where the dance was held, pretty much from the front of the convention to the Hilton side. Now it is a massive line but I kind of understand why they did this and it’s for everyone safety. For example, if everyone just bunches up in front of the dealer’s hall when it opens, there’s a possible chance of people being trampled by the ongoing crowd getting in. And they don’t want to get that complaint at the con. Plus a lot of other factors like fire hazard and more organization. So even if the huge line may have bother attendee’s way of walking around the con, it is needed. There really is no need to complain about that, instead I’m very impressed about this knowing that they are more concerned for everyone’s safety. Although I had an issue with the peace-bonding table. I’m assuming that the staff is really concerned about safety for attendees that whenever a rover sees a prop on the con floor, they immediately ask the person to get it peace-bonded. Unfortunately, I’m one of them. The spear I made for one of my cosplays was checked from the staff and it wasn’t acceptable to their part. They look at the spear head and see that’s it too sharp that I had to scratch off the tip of the blade in order for it to be peacebonded. That really upsets me. It wasn’t even sharp, it’s wood. If it’s metal, it would make a whole lot of sense but this is wood, it isn’t as harmful. Now thanks to them, I had to walk around with a scratched spear. The peace-bonding staff looks like they are pretty strict about everyone’s safety that they would do anything to get everyone safe. So any “sharp” or “harmful” cosplay will not be acceptable. I find this to be one of Fanime’s bad parts of this con. I didn’t like how I was treated for this prop and I don’t like what I had to do to make it ok for me to walk around con with it. If they can have a little leniency towards cosplayers and props, we would be ok. But with how I was treated was not cool and Fanime staff should really look into this next year. Fanime has done a really good job with Swap Meet this year. Last year’s mayhem over at the Civic Auditorium brought a linecon to Swap Meet. Some people have to wait over 2 hours to get into the building which is ridiculous. I believe their use of the West Hall next door to the convention center was a really good idea. For one thing, there’s so many space that you can store many swap meet vendors. Another thing is that the swap meet happens at night so it would not be as hot inside the building, which would make attendees feel better when it comes to shopping in the building. And the fact it’s very spacious, a lot of walking room for people and no lines going into the swap meet. I love the move, let’s just make sure this continues on for the next Fanimes. Occupancy of this con is not as packed as I thought it would be which is a good thing since I was thinking it will be pretty packed since new attendees are coming to Fanime. I believe the staff has done a really good job with space in the convention. The Gaming Hall looked really good with many televisions for people to play games like Just Dance and Super Smash Bros. and the addition of many computers for those playing MMOPRGs like League of Legends and Dota 2. Overall, I see Fanime improving and this year I saw really good improvements that help make this con run efficiently and makes the con less stressful and more fun for all the attendees. I can see that next year will be better seeing that this year they have addressed all the problems that attendees were having from previous years and have answered them by improving the con just like they did this year. 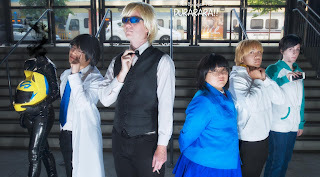 I look forward to next year’s Fanime. Oh boy it was really late for the 2nd half and I’m deeply sorry for the delay. Next convention for me will be Anime Expo 2015. It will be my 2nd time attending and might be my last depending on how it goes. I’ve heard a lot of bad things that happened last year and I’ll be there to see if AX has improved since then. Wish me luck! Anyways, Fanime 2015 coverage is over for me. Hope to see you guys at Anime Expo! Until then, it’s sayonara from San Jose. Till next year, Fanime.